International Gardening Week - Even If You Don't Have A Garden! We've been promoting the benefits of gardening and growing your own fruit and veg but not all of us are lucky enough to have the outside space to set up a veg patch. Never fear, here are some inspiring ideas with no garden required! 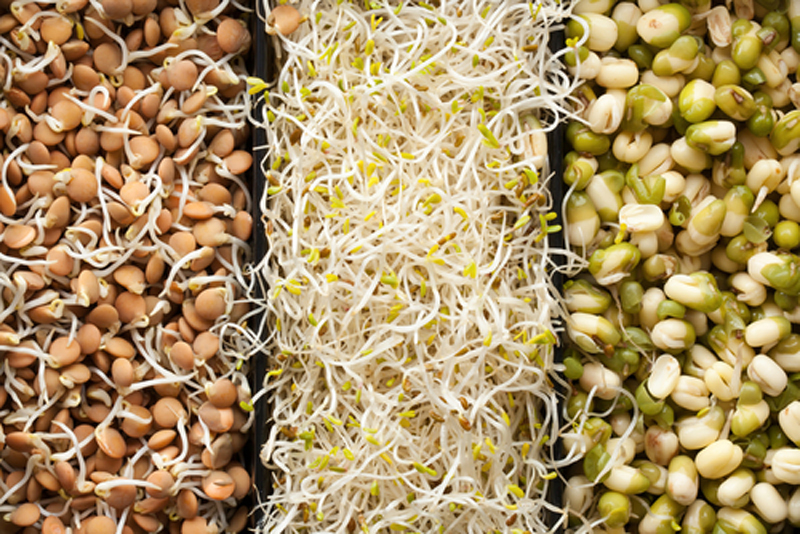 Why not try growing micro-greens or sprouted seeds? Expensive to buy, these can be easily cultivated on a warm, sunny windowsill. For nutritious micro greens, just add a 3cm layer of damp multi-purpose compost to the bottom of a foil or plastic food container with a few drainage holes punched in it, and sprinkle on some broccoli, cauliflower, cabbage, mustard, sunflower or buckwheat seeds. 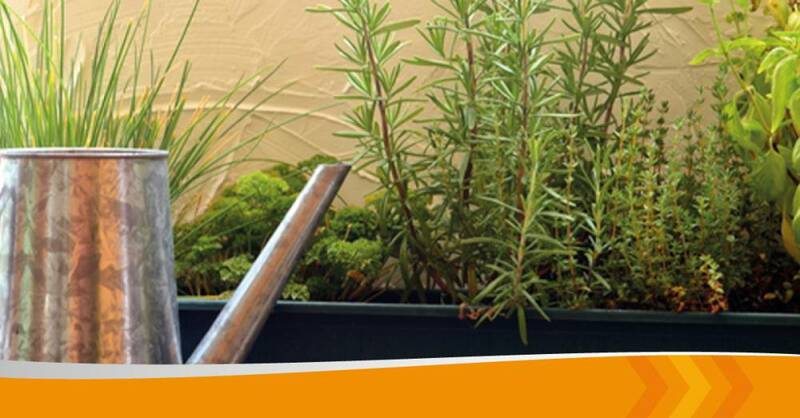 Cover with a clear lid or cling film and keep the soil damp but not wet with a spray mister. You should be able to harvest the seedlings with scissors within a few days, then wash them and add to salads. You can buy special propagators with separate layers for sprouting seeds such as peas, chickpeas, mung beans and lentils or just use a jam jar with a perforated lid. After pre-soaking, the seeds just need to be rinsed and drained twice a day to stop them going mouldy, and once sprouted, can be eaten raw or added to stir-fries. Look for further information online. Plant your window box up with some herbs – Mediterranean ones such as creeping rosemary, oregano, thyme and sage for a south-facing window or parsley and mint in partial shade. Use soil-based compost with some plant food and water-retaining granules added and water every day to stop the container drying out. Pick regularly to add to your cooking or to make herbal tea. Alternatively, you could grow alpine strawberries, radishes or cut-and-come-again loose-leaf lettuces, perhaps mixed with a few bright edible flowers, such as nasturtiums or violas, to add colour to your salads. A small patio or courtyard? 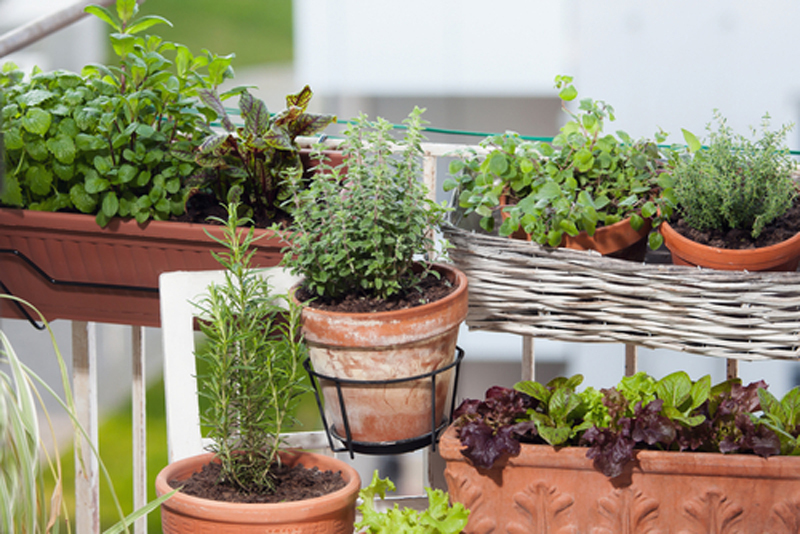 You can grow lots of things in pots and containers (the bigger the better). Use your imagination to create a vibrant display from old olive oil cans, troughs, buckets, wooden boxes and grow bags with holes in the bottom for drainage. Potatoes can be grown in a compost bag or large flowerpot. Buy special seed potatoes from the garden centre or try a couple of old spuds that may be lurking in the bottom of your fridge. In March, plant two or three potatoes in a few inches of compost at the bottom of the container, then keep covering the leaves with more compost as the potatoes starts to grow. Protect from frost, keep well-watered and stop adding compost when the container is full. Your potatoes should be ready for harvesting in July/August and their taste is incomparable. Many other vegetables lend themselves to container growing – carrots, beetroot, dwarf runner beans, peas, tomatoes, peppers or lettuces. You can even grow trailing varieties of tomatoes in a hanging basket or blueberries in pots filled with ericaceous (acidic) compost and watered with rainwater. Mini fruit trees can be cultivated in a large pot in good soil, but you must feed and water them regularly – seaweed extract diluted with water is an excellent fertilizer. Even better is a Veg Trug or similar, a large planter on legs, which allows you to tend to your plants at waist height. My 2m x 1m planter, filled with a mixture of potting compost, manure and soil, currently holds a crop of yellow beetroot (Burpee’s Golden), rainbow radishes and some French beans (Purple Prince) growing up a wigwam of canes. I will soon be picking a good handful of beans every day – quick to cook and delicious hot or cold in salads. Don’t just fill your garden with paving, decking, a lawn, dull shrubs or regimented bedding plants; make it beautiful and productive with fruit trees and bushes, vegetables and flowers all mixed together, a haven for wildlife and a sanctuary and outdoor gym for you and your family to enjoy. If you have only limited space, choose apple or other fruit trees on a dwarfing rootstock, which don’t get too big. You will need two or three different varieties that flower at the same time to ensure cross-pollination and fruiting. Or choose a “family tree” where three or more compatible varieties are cleverly grafted onto one tree to ensure successful pollination. Waterperry Gardens in Oxfordshire feature an apple tree with 50 different varieties grafted on to one trunk! I don’t suggest you try this at home, but ask for advice about self-pollinating or family trees from a specialist fruit tree nursery. 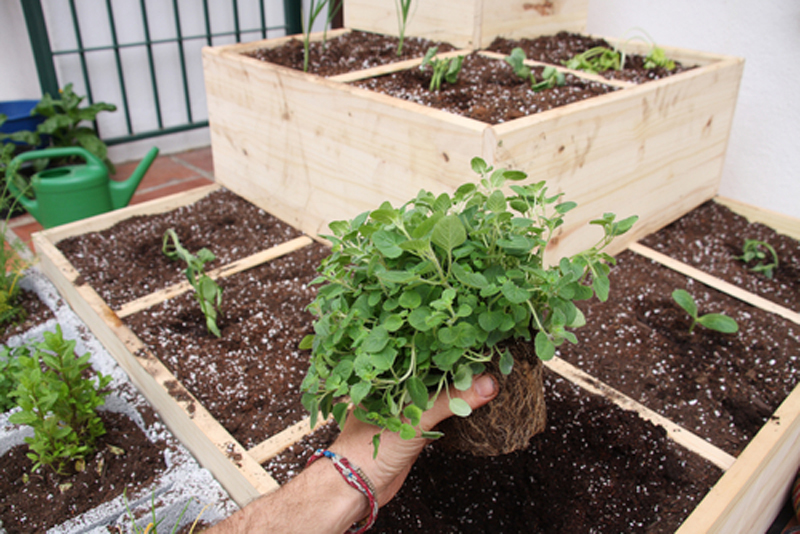 Try growing your produce in raised beds, which can result in bumper crops in a limited space. Runner beans are particularly productive, although they need sunshine and lots of water. For the cost of a few packets of seeds, you can seriously cut your food bills and enjoy fresh fruit and vegetables just outside our own back door. Buy a good gardening book, such as Carol Klein’s “Grow Your Own Vegetables”, for guidance if you’re just starting out or borrow some books from your local library. Absolutely nowhere to grow anything? Maybe you live in a city with no possibility of growing anything. 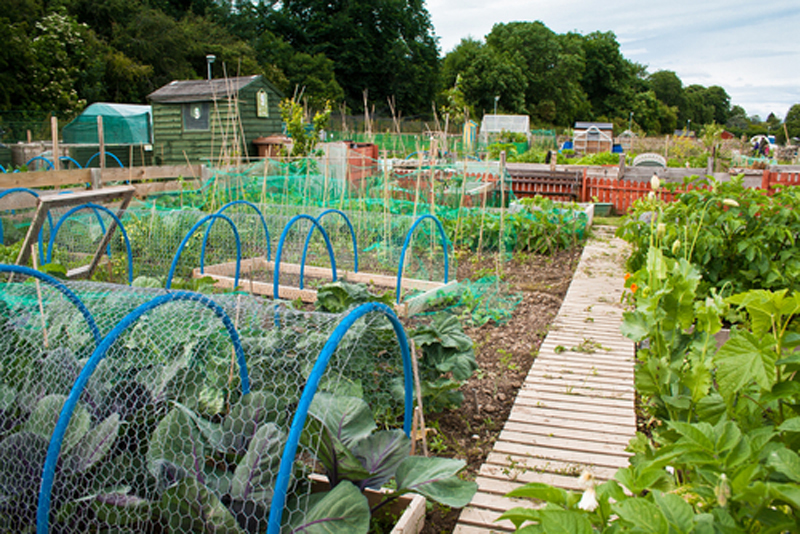 Why not apply for an allotment – a community garden primarily designed for growing fruit and vegetables. There may be a waiting list but once you start – maybe by sharing a plot with friends – the old boys from neighbouring gardens will be happy to give you advice and tips. Have a look at the National Allotment Association’s website www.nsalg.org.uk which gives advice on applying for an allotment, their history, benefits, growing for novices, monthly jobs and much more. From window box to lunch box or from plot to plate, growing your own is rewarding, healthy and great fun, gives you gym-goers a chance to really put your fitness to the test and will help you keep to your healthy eating resolutions.